After two nights in Gandia and fading jet lag, it was time to head up the coast to the city of Valencia. But not before making a few side trips to Real Monasterio De Santa Maria de la Valldigna, the famous rice fields around El Saler, and the popular village itself, just five minutes from Valencia and in the sprawling Natural Park of l’Albufera, site of Spain’s largest lake and a birder’s paradise. 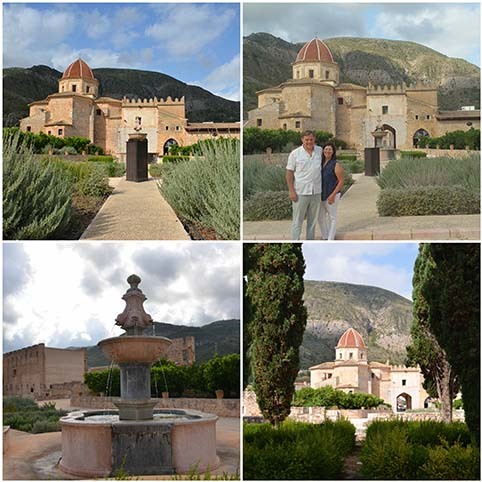 We followed Desam and Fernando by car to the countryside just northwest of Gandia to the imposing 14th century Cistercian monastery in Valldigna, a valley about 30 miles south of Valencia. 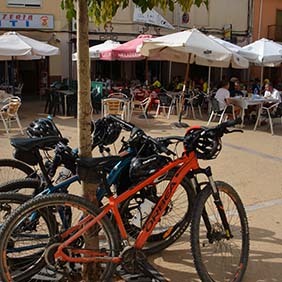 The first thing my husband noticed was the steady stream of cyclists riding through the bordering town Simat and congregating at an outdoor cafe in Abadia Square, across from the entrance to the monastery. Fernando told us (remember he’s one of them), that this area has some of the most popular weekend cycling routes around Valencia, with many backroads through the surrounding hills and valleys of Valldigna. The Monasterio De Santa Maria is a step back in time when Spain was made up of walled cities and villages around an imposing central cathedral. Under restoration by the Valencia Regional Government since 1991, the monastery went through construction phases, ranging from gothic design in the 14th century in accordance with Cistercian canons to the baroque style of the 17th and 18th centuries. Local cycling club lunch after long ride. Cheers! One of many cafes filled with cyclists. By the time we finished checking out the monastery, the village square was jam-packed with colorful lycra-clad cyclists and fancy bikes everywhere. 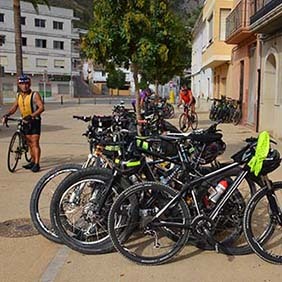 It’s a scene we saw over and over again on this trip, and it reinforced my husband’s point that cycling is one of the world’s most popular sports and clearly here in Spain, as well. On the way to El Saler, our lunch destination, we drove through Albufera National Park with what at first appeared to be green grasses (if you visit in August). A closer look revealed it to be endless rice paddies. In fact, some 250 square miles of them, something we’d never expected to see within a few kilometers of Valencia. As we learned, rice has been grown there for over a millennium. These fields are painstakingly cultivated, in many cases by hand, by the farmers. We came upon two of them who looked more like corporate CEOs than farmers. 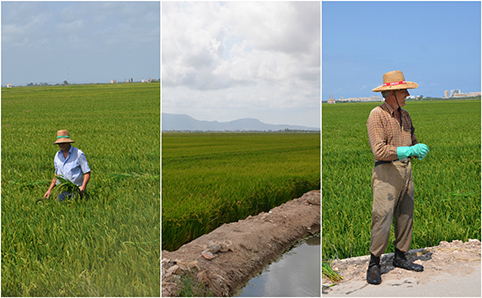 It was truly amazing that these two men had been weeding by hand all morning in this vast rice field. And still, they were smiling from ear to ear. We figured while one man’s flood is a disaster, wetlands are another man’s gold. We arrived in the bustling village of El Saler on the edge of La Albufera Natural Park and a favorite weekend destination for locals. 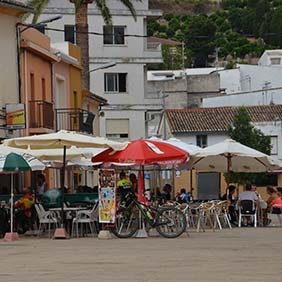 The main drag bustles with groups and families who pack the many bars and restaurants, one of the most popular of which was Casa Carmina, our destination. This cozy restaurant, clearly a favorite of the locals, has been open since 1988 and is today managed by the daughters, Carmen and Ma Jose, of the couple who started it all. 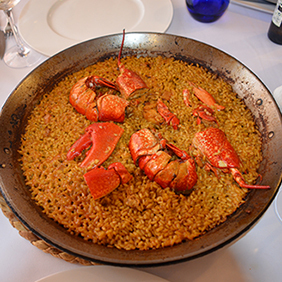 This was a perfect spot to taste local seafood and vegetable appetizers, along with several different types of paella, including seafood, vegetable, and mixed. We ate like the locals: It’s polite to eat straight out of the pan! 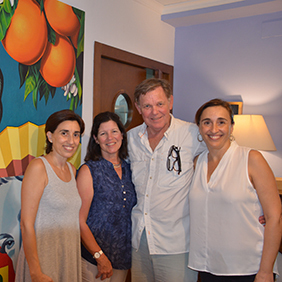 We were learning more and more about how important the farm-to-table movement is in the region, one that Valencia Tourism calls the “Del Tros al Plat” program. With busy sightseeing and a late afternoon lunch behind us, we looked forward to checking into our next hotel, AC Hotel Valencia, a comfortable Marriott property in downtown Valencia, midway between the old city and the modern beachfront. This article on active travel in the Region of Valencia, Spain appears as part of a five-part Healthy Aging® website series and a feature in Healthy Aging® Magazine. 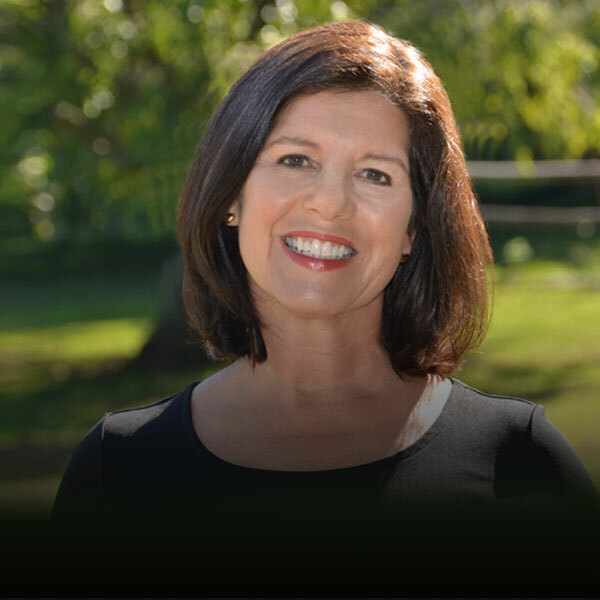 To read the full article, subscribe here: Healthy Aging® Magazine, the lifestyle magazine that is all about following your passion and what you can do rather than what you can’t.